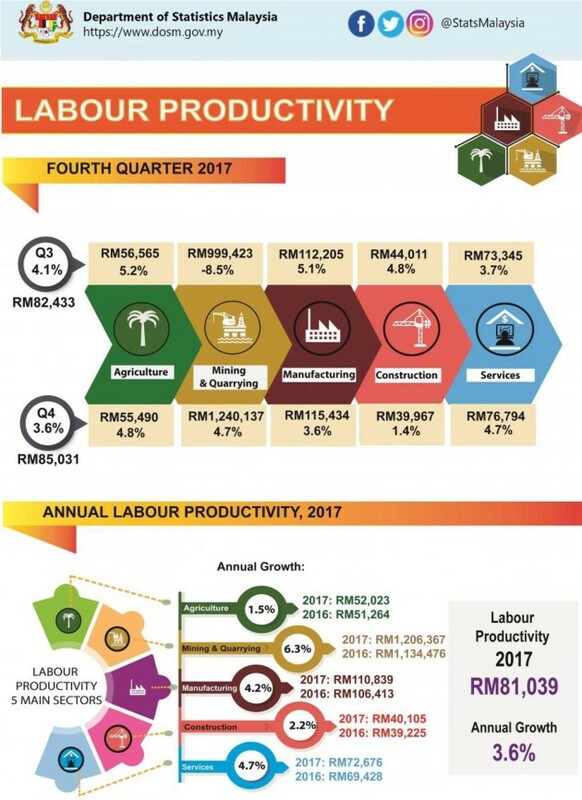 In Q4 2017, Malaysia’s labour productivity grew 3.6% (RM85,031), as compared to the 4.1% growth (RM82,433) registered in Q3 2017, as confirmed by Department of Statistics Malaysia. The economy expanded 5.9% (Q3 2017: 6.2%) while employment rose 2.2% (Q3 2017: 2.0%). Agriculture sector – Labour productivity growth of 4.8% (Q3 2017: 5.2%) at RM55,490. Value added increased significantly at 10.7% (Q3 2017: 4.1%) while employment rebounded to 5.6%. Mining and quarrying sector – Turned around to 4.7% (RM1,240,137) from negative growth of 8.5% in Q3. Value added at a marginal decrease of 0.5%%, while employment declined at 5%. Manufacturing sector – Labour productivity increased 3.6% (Q3 2017: 5.1%) at RM115,434. Value added rose 5.4%, while employment grew slightly by 1.8% (Q3 2017: 1.7%). Construction sector – Labour productivity growth of 1.4% (Q3 2017: 4.8%) at RM39,967. Value added grew by 5.8% (Q3 2017: 6.1%) while employment rose 4.3% (Q3 2017: 1.2%). Services sector – 4.7% increase (Q3 2017: 3.7%) in labour productivity. The value added registered a growth of 6.2% (Q3 2017: 6.5%) while employment grew 1.5% (Q3 2017: 2.7%). 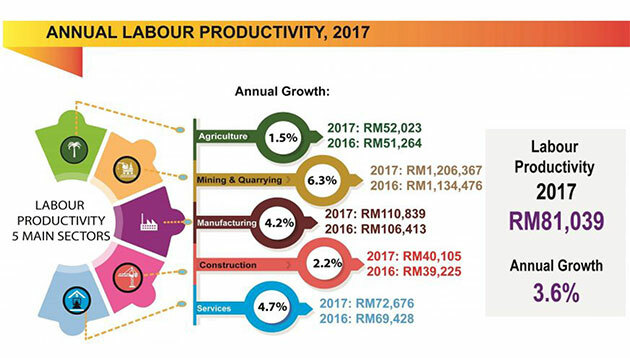 For the full year 2017, labour productivity increased 3.6% (2016: 3.5%) with a value of RM81,039 (2016: RM78,244). In line with the expansion of value added at 5.9% (2016: 4.2%), employment increased 2.2% (2016: 0.7%). Companies using languages such as English, French or Spanish have less of a corporate future orientation than those speaking Germa..
"Video isn't promising to transform HR and business practices, but it is promising to inform the ways that business gets done.".. Workers love to talk about saving money, yet only a quarter of Singaporeans save between 21% and 40% of their monthly salary, with..